We are a friendly group not affiliated to the EBU, with 38+ members and usually have 5 or more tables. The Hills Bridge Club meets weekly on Thursday nights at 7pm, Mathon Village Hall. Visitors and new members are always welcome. Contact us for more information. 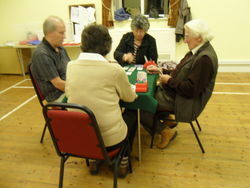 The Hills Bridge Club meets weekly on Thursday nights at 7pm, Mathon Village Hall. New members are always welcome.